Do Heat & Pollen Bother Cats? Pollen affects some cats just as it does some humans. Pollen and heat combined pose no threat, but each individually can affect cats -- and one may exacerbate the other. Like humans, some cats have allergic reactions to pollen; and cats can suffer from heat stroke. In either instance, you want to involve your veterinarian immediately. Pollen affects some cats, but it doesn't affect them the same way it does humans. Instead of affecting the eyes and nose, pollen affects an allergic cat's skin. Atopic dermatitis is the term for cat skin allergies caused by pollen. It is the second most common cause of cat skin disorders. 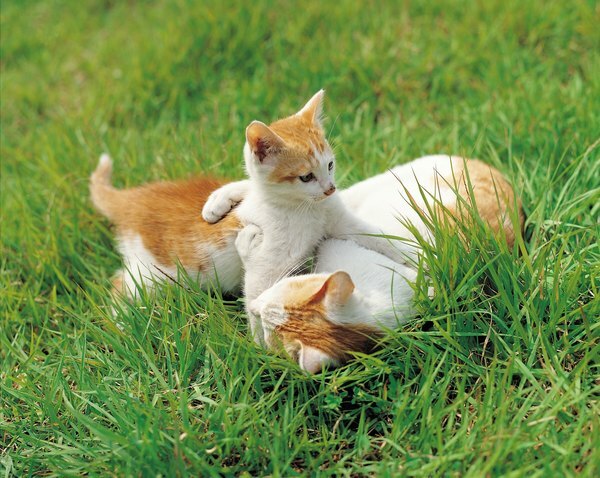 Pollen allergy in cats causes itching but may or may not cause a rash. If a rash does appear, it will be on the outside of the ears, on the head and face or on the paws. Cats who have this condition develop it between 1 and 3 years of age. It flares up during the summer. There is no cure for it, but it can be controlled with medications. It is not life-threatening, but your cat will be happier and more comfortable once it is under control. Excessive heat can cause heat stroke in cats just as it can in humans, Cats are covered with fur coats that they cannot take off. Additionally, they sweat through their paws. The condition of the body overheating is known as hyperthermia. If it happens to a cat, it can be fatal just as it can be in humans. Initial signs that a cat is experiencing distress caused by heat are panting, sweaty feet, drooling, excessive grooming and restless behavior such as continually seeking a cool spot. Signs of heat exhaustion, the next and more severe level, are rapid pulse and breathing, a reddened tongue and mouth, vomiting, lethargy, stumbling or staggering, and a body temperature of more than 105 degrees. First aid requires lowering the body temperature quickly. For a cat that shows signs of heat distress, move him to a cool, quiet place and provide plenty of water. In a case of heat exhaustion, move a conscious cat to a cool environment, soak him in cool water, not cold water, and let him drink as much as he wants. If found unconscious, soak him in cool water, being careful not to get any in his nose or mouth, and put a bag of ice or frozen vegetables between his legs. In all cases, follow up with an immediate vet visit. Do Cats Have an Appetite when They're in Heat? Can a Female Kitten Go Into Heat Prematurely? Can a Dachshund Get Too Hot Outside? Can a Cat Get Pregnant Anytime Without Being in Heat?